Information provided courtesy the Wrangler Network. 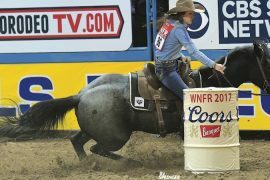 WHAT: Held in Waco, Texas, the Women’s Professional Rodeo Association honors its roots by hosting the WPRA finals at the Extraco Event Center. The organization was formed in 1948 when thirty-eight cowgirls came together in San Angelo, Texas to promote the advancement of women in the sport of rodeo. Events include roping, barrels and slot races.